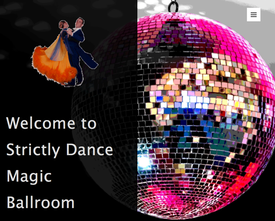 We have been running our Ballroom Dance class since the Summber of 2018 when we finally managed to persuade Robb Singer to be our Instructor for the Tuesday Night classes. Mostly by word of mouth our friends from the previous 4 years with Kens class have returned to us and we have established great links with 2 couples in the local area who run regular Tea Dances and/or Evening Dances so we will be promoting their events - See Links page. 14 couples, including couples from the beginners group, enjoyed a social get-together on Friday 22nd March. Practiced their new steps and basic routines to a range of music. Robb introduced us all to a new sequence dance ( new to most of us ) the Melody Foxtrot, in just 30min the whole group danced it almost step perfect…. ! Getting to grips with the Samba - this is going to take a few weeks!!! Tuesday Class Instructor Robb Singer reviewed two recent dances - Quickstep and Tango and introduced the Samba by looking at what we could dance from previous lessons - looks like its back to basics with some fundamental technique next week!